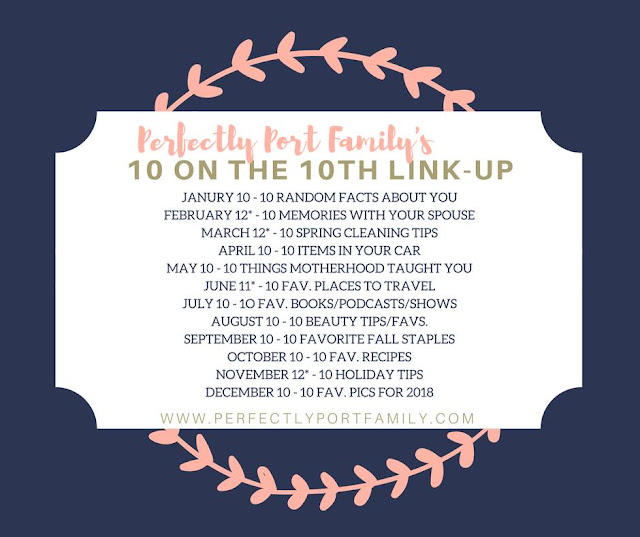 Today I'm linking up with Erin to share some facts about me for 10 on the 10th! Enjoy! 1. When I was deciding on colleges I was between Iowa State for Marketing or Wartburg College (a small private school in Iowa) for Education. I chose Wartburg because they gave me a better financial package and that in turn determined my life's path. I am now a teacher and I met my husband there! 2. I really really like 1.3 mm mechanical pencils. They're the really chubby ones and they're my fave! I have a pack of superhero ones I found on sale and I have had two misplaced/stolen at school so now the other two I have left have my name clearly labeled on them! 3. I have become "high maintenance" and now get a powder dip manicure done every 3-4 weeks. I never thought I would be one of those ladies, but a powder dip manicure is just a must now. It makes my nails hard as a rock and it lasts the full 3-4 weeks with barely a chip. I just have to get them redone because they've grown out. 4. I really like cute coffee mugs but I actually don't drink much hot coffee. When I drink coffee I usually have it cold and in a larger tumbler. 5. I spent so many years not wearing a watch, but since I got my smart watch in the last year I feel naked without a watch! 6. I used to have naturally curly hair, but after Calvin, it's gone straight! I used to be able to just wash, scrunch, and diffuse it and now there's no way I can do that. I have to curl it. It doesn't even matter what length it is. 8. I really don't watch much TV. Netflix occasionally and now This is Us, usually watching on Hulu because I can't seem to catch things when they're actually on. 9. I was born two days before leap day. 10. I basically eat the same thing for lunch every day since I started Weight Watchers last spring. I switch it up with left overs every so often, but if not, its a low carb tortilla with turkey, a Triple Zero yogurt, a small baggie of Natural Cheetoes, and some form of fruit. It's boring but good, easy to always have around, and has helped me keep *most* of the weight off since I quit Weight Watchers in October.